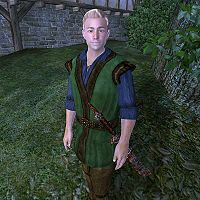 Reynald Jemane is a Breton warrior living in Chorrol. He owns a house but spends most of his time in an ale-induced haze at The Grey Mare. He has an identical twin brother, Guilbert, whom he knows nothing about, because they were separated at a very young age when their home was attacked by Ogres. He was found in the wilderness by traveling merchants, and raised at Weynon Priory. The two are reunited in the Separated at Birth quest, and are involved in two more. Before his reunion with Guilbert, he sleeps every night between 12am and 6am. Then he unlocks his door and very lazily wanders around upstairs until 8am, when he locks his door and heads to the Grey Mare. After drinking for a whopping 15 hours until midnight, he heads back home for some sleep. After moving to Weatherleah with his brother, he begins his day at 6am by going outside and wandering until 10am, when he goes inside for a drink. If there is alcohol he picks it up and drinks it. If there isn't he wanders around. Either way, he goes back outside at noon and wanders for 12 hours. At midnight he tries to sleep, but as there is only one bed, he may end up wandering if Guilbert gets there first. The first time you meet Reynald he will drunkenly say: "If I've told you once, I've told you a thousand times. I've NEVER been to Cheydinhal! I... oh, hang on. You're someone else. Apologies, my good friend, I mistook you for someone else. Always being asked about it, I am. 'Didn't I see you in Cheydinhal? ', they say. Well I'm sick of it. Sick and tired, tired and sick. And perhaps a little drunk. But nevermind. You look like the honest sort, so I've a job for you. You're going to travel to Cheydinhal, and find out what sort of imposter is trying to besmirch my good name. And you're going to tell him... *hic*... You're going to tell him I am quite capable of besmirching my good name on my own. He should cease and desist immediately. There's fifty gold pieces in it for you, friend... right then. Off you go." He will then give you fifty gold pieces. Speaking to him again will yield one of the following responses: "Hello love. I'll have another bottle of wine if you please. And do hurry - the last 5 barmaids I've talked to never came back... Wait... you don't work here, do you? But you work for me. At least, you're supposed to be working for me. Off you go, then." (If player-character is female.) or "Uhg. You're about the ugliest barmaid I've ever seen, and that's saying quite a bit. Come to bring me another round, have you? My mistake - shouldn't you be on the other side of Cyrodiil by now?" (If player-character is male.) Another two reminders come randomly, are the same for both sexes and tell quite a bit about Reynald's affairs and his state of drunkenness: "We've met before, haven't we? ... I don't... owe you money, do I? Ah! No, I've got it. You're going to find the fellow trading on my name. Good show - carry on." and "I swear I didn't know that was your pig. Eh? Oh. Sorry, I looked like someone else just then. Or rather, you did. Yes, that's it. Aren't you doing a job for me? You should be off, then." If once you have located Guilbert, you speak to Reynald before Guilbert arrives he will drunkenly comment: "Ah, it is you! You're the one... err... who are you again? Right, right. You were finding that fellow who's stolen my name. Have you had any luck?" After you confer that you have found his brother he will confusingly reply "What? Brother? You misunderstand. I don't have a brother. Maybe I misunderstand ... another bottle of wine will help. If you ask him about Guilbert he will again confusingly reply: "What? Either I'm far too drunk, or I'm misunderstanding you. I have a brother? How can that be? My family was killed long, long ago. At least, that's what I'd been told... perhaps it's time for me to stop drinking. And he's coming here to see me, you say? Yes, I'd better sober up." Then when asking about Reynald himself he will state: "Yes, that's me. And apparently some other fellow, as well. Strange thing, that. Knowing that someone else is also you... makes my head hurt." When approaching him later on he will say hopefully: "Brother? Wow... hope he's got a wine cellar!" When the Jemane brothers have been reunited, Reynald will exclaim: "My good friend! Let me drink to your health! For more saving my brother ... no, for finding him ... or was it for finding me? Anyway, bottoms up!" When further asked about Guilbert he will state: "He's Guilbert. I'm Reynald." Once you have begun the Legacy Lost quest, Reynald will always say "Guilbert should be able to help you with anything you need... for now, I'm going to celebrate! Some people will offer rumors about Reynald: "Reynald Jemane has a terrible memory. We've met many times, but when I saw him in Cheydinhal, he walked right past me like we were strangers." When you have located Guilbert, people will say "Mystery solved, eh? Reynald had a twin brother. Well he had all of us fooled." He wears a blue and green outfit with a pair of doeskin shoes. He also carries four bottles of ale, his key, a spare pair of tan linens, a leveled shortsword that is always the best possible quality for your level, and a leveled amount of gold. During the Legacy Lost quest Reynald and Guilbert will follow you, and as they are essential they make handy allies. While they are following you, sometimes when you ask Guilbert to wait, Reynald will still follow you.